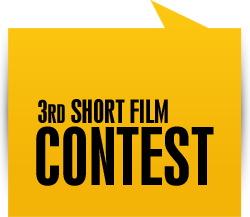 These are the 3 Winners of our 3rd Short Film Competition. Synopsis: Chepe is leaving his house to go out to his little plot of farmland. He says goodbye to his wife who sells goats milk. His wife decides to give the milk to their little boy who is hungry and they don´t have enough food for him. When Chepe gets home, he is furious and physically attacks his wife. Quico intervenes in her defense and confronts Chepe. When the woman sees that Quico is strangling her husband, she picks up a stone and hits Quico over the head, killing the man who was defending her. Synopsis: Reality as told by the innocence of children. This is the story of a little boy who tries to answer the questions that his mother cannot. He does not understand why his mother won´t let him play with his best friend since, from his point of view, they are equal. Synopsis: Gustavo is a young musician who has become distanced from his mother as a result of his artistic commitment and family resentments. Arriving back home after a tour abroad, his mother surprises him in his apartment where she expresses her unconditional love and asks him for forgiveness and to rectify past errors. She does this while preparing him a special dinner which he will never forget. Synopsis: Two days after the disappearance of Narciso González, Rolando, the oldest in a family of orphaned children, is attacked by police while in a protest. He goes home to get a gun to go back out to deal with the policemen but he realizes that his younger sisters will be badly affected by what could result from this situation. Synopsis: Sarah returns to her hometown in the Dominican Republic following the death of her grandmother. She comes home to a past from which she cannot escape. Synopsis: A young man lives his life according to the twists of fate and constantly makes choices by tossing a coin, something which makes his girlfriend very uncomfortable. But there comes a day when everything is put to the test in their relationship. Synopsis: After an unexpected break-up of a couple, one of them will encounter the surprise of a lifetime. Synopsis: When Juan is walking home one day, a prostitute walks past him and drops some money. Juan picks up the money, but soon realizes that instead of solving his problems, it only complicates them. Synopsis: This story is based on a car accident which ends up later in the office of a man who has been nominated for an award for his artwork. Synopsis: Sr. is an elderly grandfather who has been dressing up for the Carnival his whole life, but now he is sick. His grandson is begging to see him in his costume and even though he is sick, he agrees. In the middle of the Carnival parade, he has a heart attack and dies. The grandson, at the cemetery, promises his dead grandfather that he will be a Carnival character, known as a lechon, for the rest of his life. Synopsis: Carlos is a disturbed man. He has nightmares that won´t let him sleep. His wife Sara is tired of the mistreatment and anxiety. It is time to find a reason behind this problem and to confront it, even if it means the loss of everything. These are the 44 entries selected to participate in our 3rd Short Film Competition. Synopsis: This is the story of a man who, in the midst of his daily activity, receives a light that will show him a new way of achieving his goals. Synopsis: An old woman, uncared for and abandoned, with no desire to continue living, receives a gift which changes her life. Synopsis: The drama of life and death. A batter and a pitcher confront each other, face to face; eye to eye, destiny against destiny. The pitcher throws his best ball, the batter responds with a powerful swing. Synopsis: A young man does not admit to being in love until a series of events cause him to doubt whether what is happening is real or not, until he manages to recognize his feelings. Synopsis: After buying a telephone calling card which then gets stolen, a person complains to the owner of the shop then to a customer service representative of the telephone company. Unexpectedly, the person who was robbed finds those responsible for the theft in a 4-way coincidence that reminds us that we indeed live in a small world. Synopsis: This is the first science fiction short film ever made in the Dominican Republic. To make this, the films creators sketched out three challenges as their goal: to work in a genre that has never been explored in Latin America, to tell a story that does not require dialogue or specific verbal indicators and to make a film that uses special effects, character make-up and exotic locations. Synopsis: After Santo Domingo is totally destroyed in the 3rd World War, a young military man struggles to survive the worst drought ever experienced on the face of the earth. Synopsis: Elsa, in her attempt to be accepted by those around her, is closed in the bathroom where she can hear what people are saying about her until she finally decides to liberate herself from her self-imposed insecurity. Synopsis: A young man who is addicted to technology wakes up one night, frightened, as he realizes he is in a vicious cycle and cannot get out. He has nightmare after nightmare, confusing the letter “b” of Bible with the “b” of his BlackBerry. He is never without his phone. He dreams he is in a fire, trapped in a labyrinth with no way out. He sees that other young people have fallen into the same situation; he can see things that others cannot. He finally realizes that his addiction to technology is ruining his life and he decides to free himself from this evil. Synopsis: A group of young people work in a press office. Their boss sends them on a dangerous assignment which has many implications. They realize they could be risking their lives but their boss won´t back down because he wants the story at all costs. Synopsis: This is the story of a man who discovers his wife is having an affair. He kills her and her lover then, later, out of guilt he ends up committing suicide. Synopsis: A group of scientists have been working on a project for the creation of a new life form and have taken over a strange island as their base of operations. Commander Alex Cross and his team have been sent to the island to see how the scientists are progressing. When they try to return home, they are attacked by a squad of machines and mutant creature that impede them from leaving the island. Synopsis: While reading a book about the recent history of the Dominican Republic, a woman decides to invite her four nieces to show them this part of the country´s history in patriotism, sacrifice and achievement obtained through the youth of that period of history who decided to struggle for their ideals and for a better future. Synopsis: Diego, in a hotel on vacation, seems bored and depressed until he meets Merlo with whom he strikes up a strange and intimate friendship. Meanwhile, at the hotel one of the guests disappears mysteriously. It is Merlo´s last day at the hotel and they decide to go to the beach for the last time. Synopsis: Carla, a young entrepreneur, finds out while at the airport that her boyfriend, returning from vacation, has missed his flight. Carla decides to spend the night at the home of her mother who is also on vacation. Carla experiences sensations which help her to recreate the tragic death of her father at the hands of attackers. Synopsis: A young woman, with her whole life ahead of her, is mistreated within the four walls of her own home. One more victim of violence against women by her partner, she suffers in silence out of fear of what people will say. Her yearned-for dream of a happy home is turned into a true nightmare, in a virtual captivity of torture. Synopsis: A little boy with big dreams meets up with another boy with huge limitations. They form a strong friendship. Euclides… El Viejo Vendedor de Pan. Synopsis: Euclides is an elderly man and one of the most renowned bakers in the city. He delivers his bread on his bike through the streets of the city; his bike is long, thin and rusty, very much like himself. However, he has only hung on to a small number of customers due to the modern ways which food is now delivered in fast cars. Some of his colleagues are treating him badly while others are supporting him. Everything changes suddenly one day in the streets of the city. Synopsis: This is the story of a little boy, his mischief and the lack of awareness on the part of his father toward nature that puts his life into danger. The boy’s father pays no attention as he pollutes that water in the irrigation water canal; the most threatened by this is his own son. Synopsis: It seems to be a normal day for two people who have nothing in common. Each one has their own destination but life presents a surprise for them in which one ends up being the other’s salvation. Synopsis: This is the story of a young Christian called José who wants to please God with his life but situations occur and present obstacles that prevent him from leading a life that coincides with this desire; prayer continues to be a powerful weapon to overcome the adversities that confront youth. Synopsis: This short film is proof of the human desire to survive and the importance of perseverance in the face of challenges. The story is about the life of a young married couple in which the husband leaves to find work for a better future and the pact of loyalty the couple makes. Synopsis: Love and tragedy blend into a catastrophe – the earthquake of Haiti. A Dominican woman hears the news of the quake and decides to cross the border to rescue her husband but to find him, she will have to recall the old days when she loved life. Synopsis: Maximimiliano, a priest committed to his vows, decides to commit a sin, for the first time. He realizes that his love of God is stronger than his carnal desire and he confesses his sin to the Parrish priest of the church, provoking a series of unexpected events in the story. Synopsis: This time I am not going to tell you what it feels like to be poor, nor how I became rich. I just want to tell you about SerGio, who used to live only for money and now he gets up and has it by his side. SerGio is the story of two people and one point of view; two points of view and one person. Synopsis: This story leaves us with the message of how important it is to forgive and that God has a plan for each one of us, even the criminal. Synopsis: At the end of an afternoon like any other, Cuervo decides to release the emotions and desires he has had since he was a baby: to fly. Synopsis: Andrés, Yuddy and his son Manuel are members of a family that is going through difficult economic times. Andrés gets pulled into a swindle by his friend Carlos and ends up getting involved in illegal activity. Synopsis: Revelations of a couple, all the secrets, a past…there is always a before and after. Synopsis: The story centers on the drama of a teenager who projects her fears and desires through a mysterious girl called Ave who she makes live in her closet. Confronting family cruelty in the face of her abnormal behavior, Ave tries to break out using this secret. Ignored by her mother and sister during a visit to her grandfather’s, she will face slavery and death in a world where fantasy and reality are indistinguishable. Synopsis: This is a film about solidarity among people, regardless of their social status.